I added some more homey touches to my room! I finally bought a frame for my Audrey poster! I bought mine from Target for around $7, but they must only sell them unframed in the store because I could only find a pre-framed one for $70 online. My advice would be to shop around. I feel like I'm always seeing posters on sale at Rue La La, too. I also bought a command hook for outside my bedroom door! It matched my keychain perfectly! I have a private room, so even though I share my bathroom and hallway with a roommate, we have separate bedrooms with our own doors. Said doors lock, and I've gotten into the habit of locking mine when I go out. This would be a great idea, except on days when I'm rushing or late (We're talking rarely, haha) and I lock my door with my keys inside! Total dilemma because after the first time, our front desk charges $10 every time we need them to unlock our door! (Which is crazy expensive considering that they do nothing at that desk anyway!) So obviously I'm already in the habit of leaving my keys outside my door! The magnetic board is mostly for displaying pictures, but I also clipped the school calendar to the bottom. I use my Apple calendar on my iPad and Macbook, but the school calendar has all the fun days already on it, like Free Cookies in the Union day! Totally handy dandy. So it's safe to say that I'm adjusting well to dorm life. How about y'all?? 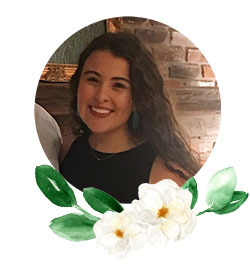 Anyone have a scary roommate (mine's super sweet) story or something you want to share about your first few weeks at college?? I'm a college student now, and I couldn't be more excited! I said that I'd share some pictures of my new dorm room in my last post, but I had to unplug (i.e. no social network at all) for my first week because of sorority recruitment. 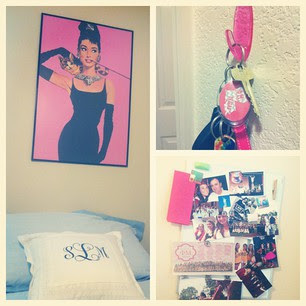 But now I'm back along with a few snapshots of my room! I'm so sorry I don't have better pictures, but the lighting in there is terrible. I'm not completely finished decorating anyway, so it's still a work in progress. Here's my bed! I love my bedspread, it's blue & white seersucker! 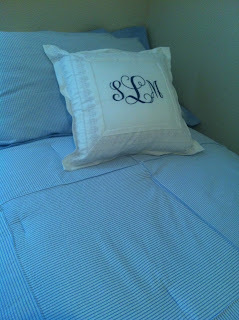 And of course I had my frilly throw pillow monogrammed! Sorry for the horrid lighting. I promise it's cuter in person! 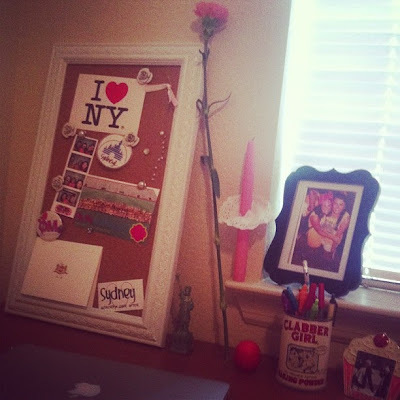 I love my desk! It has all of my favorite things on it: New York, baking paraphernalia, and of course, goodies from my new sorority! Bonus points if you can already tell which sorority I chose! 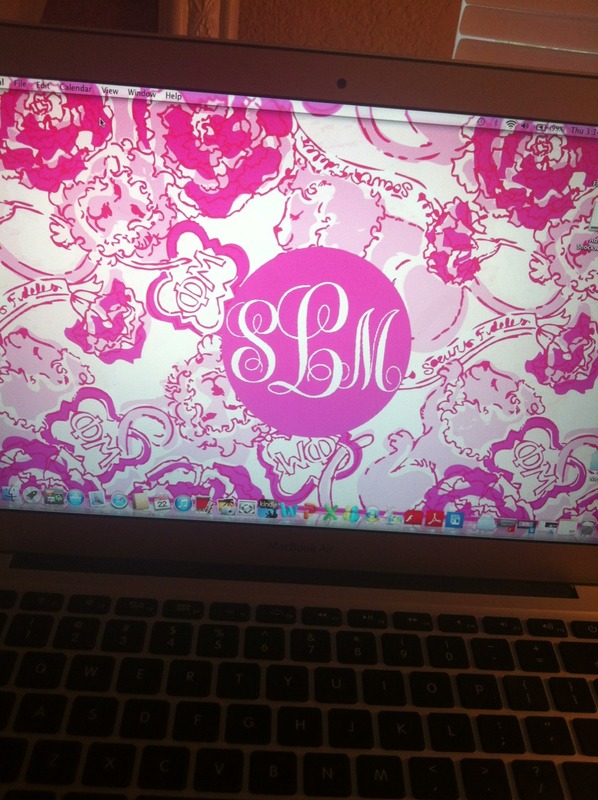 In case you can't already tell which sorority from the quatrefoils or rose-colored carnation, here's my last dorm room picture: my new laptop wallpaper! Yay for monograms, pink, Lilly, and lions and ΦΜ! That's right! I pledged Phi Mu and I couldn't be happier! I love everything about my new sorority! College has been super exciting so far, and I'm loving every busy minute of it! I'll try to keep y'all updated! Hope y'all are having a great Labor Day weekend! Any chance I have a sister reading?? That would be so neat!